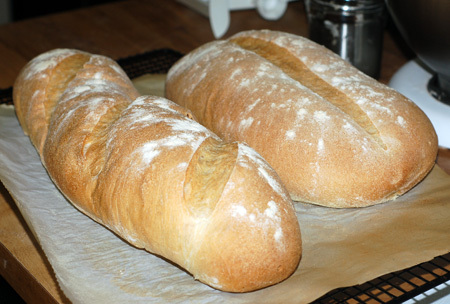 My husband wanted his own opportunity to break in the new convection oven by baking some fresh bread, and he took advantage of his free time on Memorial Day to bake these two gorgeous loaves of Italian bread. The recipe is from Bread Baker’s Apprentice, and uses a biga to impart maximum flavor to the bread. We were able to test out the oven’s proof function for these loaves, and it helped the dough rise to perfection; this will be especially handy in the winter when the house is too cold to facilitate good yeast growth. While the bread baked, Jeremy kept a watchful eye on it by taking peeks with the oven light (opening the door repeatedly is hard on the convection fan, besides letting the heat out) and Nolan realized immediately that there was something yummy behind the glass. He started trying to open the oven to get at the baking bread, and had to be distracted with a snack. 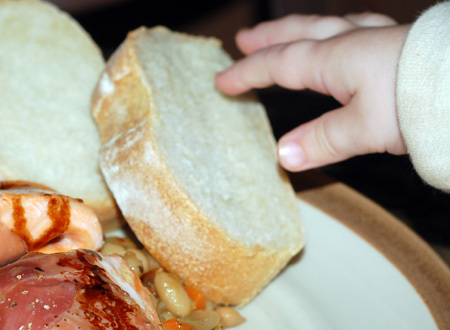 A few hour later, when I set my dinner plate down to photograph it for the blog, the little bread fiend pounced and made off with a slice of soft, fresh bread. This kid knows a good thing when he sees it! 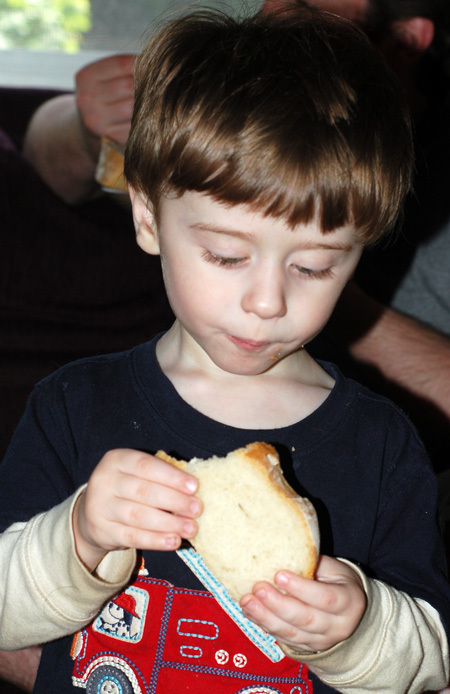 He ate about 3 slices of bread, crust-first, and had to be reminded to eat the rest of his dinner. To go with our Italian bread, I whipped up an Italian-style meal. 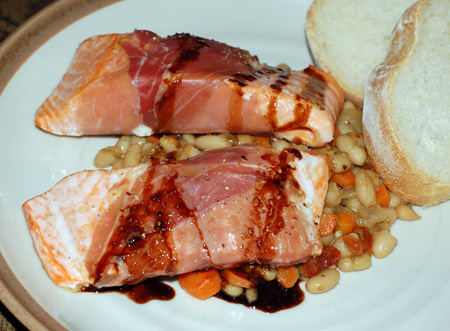 I decided on prosciutto-wrapped salmon drizzled with balsamic reduction and served over a simple white bean ragout. The salmon recipe called for baking, but I suspect that pan-roasting would be a better way to go, allowing the prosciutto to crisp up more beautifully. As is, the salmon was just alright, but the balsamic reduction helped. I just reduced about a half cup balsamic vinegar to a few tablespoons, and mounted it with a tablespoon of butter for a little extra body and gloss. It tied everything together, pairing perfectly with the fish and beans, and serving as an ideal dipper for that bread. The bean ragout was really the focal point, simple as it was. It filled the house with a rich, earthy aroma and could easily be adapted to complement a wide range of main dishes. Place some olive oil in a sauté pan and cook the onion, carrot, optional pancetta, sun dried tomatoes, vinegar and garlic about 8 minutes, stirring occasionally, over medium high heat. Add the beans, sage, and chicken stock to the onion/carrot mixture, bring to a simmer and lower heat to medium. Continue to simmer until flavors have combined and chicken stock has mostly reduced. Adjust seasonings and serve warm, with chicken, pork, beef, or fish. Serves 2-3. Source: Adapted from Stephencooks and Epicurious. Using dried beans: Soak 1 C of dried bean overnight in water to cover. Drain and rinse them. Place in a pot with stock to cover, bring to a boil, then simmer until just tender, about 45 minutes. Drain, reserving the cooking liquid. Once you’ve sauteed your aromatics, add the beans, herbs and a cup of bean cooking liquid, place in a casserole or heavy pot, cover, and bake at 325F for 40 minutes, until beans are tender. Flavor variations: Use fresh or dried rosemary, parsley, bay or any other herb that will complement your main course. White balsamic, white or red wine, or sherry vinegars would all work. Bacon or even ground pork could be used in place of pancetta. For a background tomato flavor, add 2 T tomato paste to the aromatics. To make a 3-bean ragout, trim a handful of haricots verts and add those, with a handful of shelled edamame, to the beans and stock for the last 4 minutes or so. Use variations: Serve with any sort of meat. Alternately, puree with a few tablespoons of olive oil and enough stock or bean cooking liquid to make a spreadable dip for vegetables or crostini. Or add a can of diced tomato and juices, and some chicken stock to make bean soup; partially puree it to make a thicker texture, if desired, or add a handful of small pasta.